Near the two slot machines and the change machine. 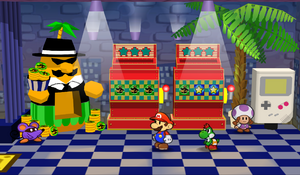 The Pianta Parlor is a casino in Rogueport in the game Paper Mario: The Thousand-Year Door. Mario can come here to play minigames for Pianta Tokens, which can be exchanged for items and badges. There are slot machines as well as four minigames to play, and each of the minigames use the four different curses Mario receives from the Black Chest Demons. The slot machines are initially there, but Mario must complete certain troubles to receive cards to play the other games. Beginning in Chapter 6, Don Pianta will hang out at the Parlor. To play a slot machine, Mario must deposit one Pianta Token. The slots will then spin. If Mario matches three of a kind, he'll get more Pianta Tokens. Three Don Piantas give him three Pianta Tokens; three Stars give him fifteen Pianta Tokens, and three 7s gives him one hundred Pianta Tokens. The Special Card is needed to play this game. In the Plane Game Mario must fly down from a high platform and try to get as far as possible. The farther Mario goes, the more Pianta Tokens he will win. There are also several spots to multiply the amount won, but there are also spots that subtract the number of Pianta Tokens Mario will receive. Some Pianta Tokens float in random spots in the air. The player must have the Silver Card to play this game. In the Paper Game, Mario and a massive crowd of different species must race towards a finish line. Mario is not timed, but he still needs to get in first to the finish line. Large fans blow against Mario and the crowd, and if Mario isn't careful the wind can push him into a pit. This causes him to "retire" and forfeit any Pianta Tokens he might have earned, but if he turns paper-thin, the air will just pass by. However, moving in Paper Mode makes him run slower. Luigi, Koopie Koo, and Wonky have a cameo appearance in the race. If the player comes in first place, they will get 20 tokens (earning ten tokens as it costs ten tokens to play). The player must have the Gold Card to play this game. In the Tube Game Mario is in tube form and has to move as fast as possible around barriers and obstacles on a track with no rails to get to the finish. Turning is a problem and since there are no rails, it's easy to fall off and lose precious time. Pianta Tokens are scattered through this stage. A technical bonus is given if Mario doesn't fall off the stage. The player needs a Platinum Card to play this game. In the Boat Game, Mario is in boat mode and he must sail between floating barrels and whirlpools to make it to the finish. There are also Pianta Tokens scattered through the stage. He is timed and this game can be considered difficult. A technical bonus is given if Mario doesn't hit any whirlpools. Mario can use Pianta Tokens converted from the Don Pianta machines or from winning the minigames to trade for prizes. Getting membership cards unlocks new prizes. Monte Gēmu モンテ (Monte) is the Pianta's Japanese name. Spanish Juegos Foresta Foresta come from the Pianta' Spanish name: Forestano. Lahla is a Boo working at the desk behind some bars; Mario can slip through the bars to find out info about her if he gets a high score in the minigames. An old original Game Boy appears near the door and shows the high scores for the various games. The Pianta Changer was added to the Parlor five years before the events of this game, as shown in the first issue of the RDM. The same issue states that the Pianta Parlor was temporarily shut down as a result of Goomfrey beating up the Pianta Exchanger. The robot later commented that it didn't feel pain as it was a machine. This page was last edited on April 4, 2019, at 08:17.